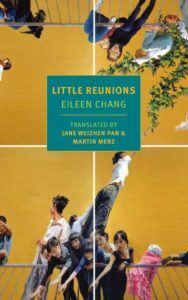 Little Reunions was written over a period of twenty years, begun sometime after Eileen Chang’s arrival in the United States in the 1950s and finished in the late 70s. But it was not published in China, Shanghai, and Hong Kong until 2009, some fourteen years after Chang’s death. Chang was told that the book contains many characters too similar to figures in Chang’s life and, thus, the book was considered too risky to publish. Following her death in Los Angeles in 1995, The New York Times ran an obituary that stressed the juxtaposition between her life of seclusion in the United States and her immense stature in Taiwan and mainland China. Since the 2007 publication of the short story collection Love in a Fallen City in 2007, Chang’s stature has been steadily growing in English-reading circles. The stories collected in Love in a Fallen City were written by Chang in Shanghai during the early ‘40s–a period of time that parallels the events in Little Reunions though with scant mention of the popularity of her work amongst readers. 2015 saw the publication in English of Naked Earth, a novel written just before Chang’s emigration to the US. She lived for several years in Hong Kong and served as a translator to the United States Information Service. She was also commissioned to write anti-communist literature, one of which was Naked Earth, a novel Chang herself translated into English. Half A Lifelong Romance, perhaps Chang’s most popular novel, was published in 2016 in a new English translation. In the introduction to Love in a Fallen City, translator Karen S. Kingsbury contextualizes Chang’s work. She notes that the Republic of China was, in its four decades of existence, “marked internally by a New Culture Movement that promoted modern (and more or less Western) forms of patriotism, science, and individual rights, including women’s rights.” One could read Kingsbury’s introduction, which offers a short biography of Chang’s life, and easily mistake it for an unembellished retelling of the events of Little Reunions, a book unavailable to Chinese readers until several years after Kingsbury’s words were written, so closely do the events parallel each other. The narrative of Little Reunions does not move along a linear timeline. An older Julie, now living in New York, moves among her reminiscences: from scenes of her childhood in the home of her opium addled father to her stay at a convent school in Hong Kong at the onset of the second World War. The novel gradually reveals itself to be primarily preoccupied with Julie’s relationships with her mother, Rachel, and her first serious romance with the Japanese spy Chih-Yung. Chang’s fiction has been praised by critics as unique for being detached from politics yet it strikes me that its less that politics are not prioritized but that the lives of Chang’s characters experience the effects of war and nationalism and upheaval as altering the landscape of relationships. As the translator notes, the “Little Reunions” of the title marks the many returns of Julie’s mother and lover, Chih-Yung, from great distances abroad after long periods of separation. Julie’s solitude and reflection punctures the reunions. Her life is marked by the sudden absences that follow long periods of interaction. Julie’s memories distort the length of these periods of waiting. Discrete flashes of extreme emotion break up the larger floating spans of time — the rituals of eating, speaking, and living alongside people for an extended stretch of time coalesces. The distinction between mundane ritual is lost when repeated day in and day out. The novel opens with Julie in contemplation: “‘Rain. It’s like living by a burbling stream,’ Julie wrote in her notebook as her thirtieth birthday approached. ‘Hope it rains every day so I can believe your absence is due to the rain.’” In evoking the image of a perpetual rain, Chang proffers an image of movement that perpetually stays the same. Chang has been referred to as China’s Joan Didion. She is a stylist. And this novel has a delicate way of describing the sensuality of bodies meeting and touching for the first time after many months apart. The outside meets the inside. In a passage recounting one of Julie’s clandestine encounters with her lover Chih-Yung, the language describes the separation between outside environment and an interior landscape dissolving. Her legs weren’t particularly skinny. A band of skin, smooth and white, remained exposed above her socks. A gentle breeze caressed the palm fronds. The tide rose on the sand as the meandering white line stretched to the horizon, imperceptibly ascended and then retreated, yet seemingly motionless. She wanted this feeling to last forever, or at least to let her luxuriate a little more in this golden immortality. Chang’s description links the movement of the breeze and the wave nearby to the sensation of Chih-yung’s caress. The commingling of two bodies does not end at the point of contact between skins. Julie does not separate the sensations; she opens up to all kinds of feeling that the situation and the experience of the situation reveals. In the desire for “golden immortality,” Chang suffuses Julie with melancholy. The novel is framed, quite explicitly, through the perspective of a later Julie, a Julie who has already experienced everything the novel details. That Julie of the future is alone and living with the bitter understanding that this bliss is elusive. A reunion, which the novel’s title foregrounds, implies impermanence — a reunion has an ending — and a certain kind of bliss can only ever be experienced alongside another person — another person means another person’s set of desires and a set of factors out of one’s control. Inevitably the future is a future where separation and seclusion are a few of the only things one has any control of. Little Reunions is in many ways a coming of age novel, and like many novels in that vein, the protagonist craves for a life within a world that exists beyond her immediate surroundings. Her mother’s frequent travels to Europe make an impression on her (Julie likens her to a character out of a English novel), and she is disappointed when her plans to attend boarding school in Europe are interrupted by the outbreak of war. Romance, and the romance Julie envisions for herself, offers another escape. Julie expects that “first love” will be immensely significant. But there is always distance. Geographic distance, in the comings and goings of her mother and Chih-Yung, as well as the distance evoked by in the recollection of memories of a recent history that perpetually recedes. Chang’s novel depicts long periods of waiting, waiting for another person to return to one’s life. Long periods of time are conflated into floating habits and rituals — recurrent, similar actions — that are broken up by jolts of shock. Patrick Disselhorst is a writer currently living in New York.